All the fighters slated to participate in tomorrow night’s “Bellator 110: Rampage vs. M’Pumbu” event tipped the scale today inside Mohegan Sun Arena in Uncasville, Connecticut. Two of Bellator’s biggest mainstream stars will be on display Friday. 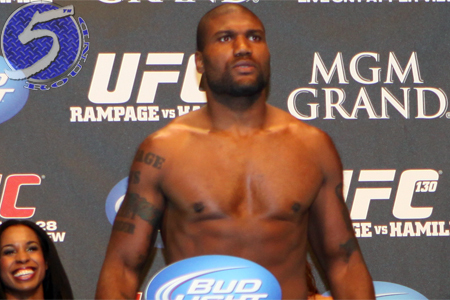 Former UFC light heavyweight champion Quinton “Rampage” Jackson (pictured) meets Christian M’Pumbu in the semifinals of the Light Heavyweight tournament, while Muhammed “King Mo” Lawal battles Mikhail Zayats on the other end of the tournament brackets. Spike TV will broadcast the main card tomorrow starting at 9PM ET/PT. ## – Jackson initially weighed 206.5 pounds.